THIS ITEM IS NOT AVAILABLE AT PRESENT. WE WILL NOT BE GETTING ANYMORE Star Wars Logo Stainless Steel Huggie Earrings. From the Star Wars collection by Body Vibe. 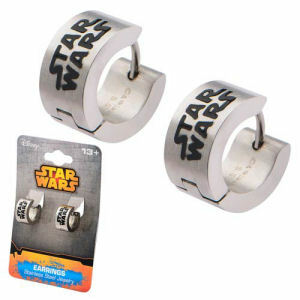 Star Wars Logo Stainless Steel Huggie Earrings. Earrings measure just over .25 of an inch in width and a half an inch high.